Home › Review › Review: gOS 1.0 – What’s All The Fuss About? I fired up the liveCD without too much trouble but I encountered the old problem I often have with my motherboard. I got a kernel panic after the menu screen and a message telling me that APIC sync had failed. It wasn’t a surprise as this OS is basically Ubuntu under the hood and I get this a lot with Ubuntu on my system. I got around it by adding the “noapic” command to my boot options and then everything was fine. I loaded the live desktop and proceeded to install via the shortcut, the installer seems to be completely unmodified from Ubuntu so there were no surprises. It did take a really long time to complete though and I had to wait about 30 – 40mins in total. It seemed to freeze at 82% as the status message said “Configuring APT – Scanning for mirror”, I was tempted to abort and try again but after 10mins or so it did continue and complete the install. I’ve had a think about what could have caused this and I can only assume it was a busy server making package downloads slow. It’s not my Internet connection as I tested that on another machine and it was fine. 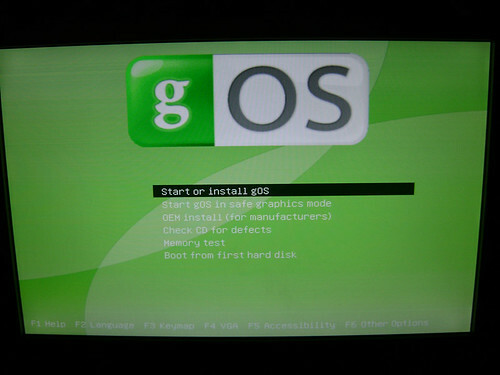 Maybe there were a lot of people installing the OS at the time I don’t know, it reminded me of the problems I had installing Mint so it’s not unique to gOS. Note: I had trouble getting screenshots with Enlightenment, no matter what I did it wasn’t having it so there’s no real installation slide show I’m afraid sorry. On first login the system asked me for the administrator password and I wasn’t sure what this could be about, I duly supplied it and was then asked to install the Google Toolbar for Firefox, not surprising as this is a Google related product but still I declined and moved on. It’s quite funny because often with gOS you can see the standard brown Ubuntu desktop for a minute while it loads something. This happened quite a lot. I was asked to perform 84 updates to the system after the install and it reminded me a little of the old Windows experience, I was half waiting to be asked for Service Pack 1 or something 🙂 Again the updates were very slow and I can only ascribe this to busy mirrors and bandwidth problems. The screen resolution was set to 1280×1024 which looks a little funny on my 19″ widescreen monitor and it was using a generic driver, it seems the restricted driver manager you expect from Ubuntu has been removed here. I tried to install the latest Nvidia driver with apt-get but it was a little tricky to setup, certainly not something for a beginner I don’t think. I suppose you have to remember that this OS was designed to be sold pre-installed on a certain set of hardware and I doubt much time was put into making it work on anything else. Why would it be? I tried to use my NTFS drive and found I had to install NTFS-3G with apt and then mount the drive through the terminal to get write support. A year or so ago this would have been standard but these days most distributions take care of this stuff for you. I also found the file manager crashed a lot when I tried to access the drive, it was pretty frustrating all in all. This was the first time I’d used the Enlightenment window manager and I don’t know how heavily customized this is compared to the standard version but I have to say I didn’t like it much. The file manager is atrocious and that’s not something I say lightly. I found just moving my files around was a complete pain in the neck. Maybe it was because I needed to learn more about the interface, I suppose that’s possible but it really wasn’t impressive. The scrolling icon menu at the bottom of the screen looks pretty nice but quickly started to irritate me. It’s not to my taste. As you would expect with a Google influenced OS pretty much everything is just a link to a website, Google Docs, Calendar, Spreadsheets, Facebook, Blogger and so on are all the main options. You can install stuff with the package manager and it seems that the main Ubuntu repos are available but it feels a bit like an Internet cafe kiosk or something. Is that what you want at home? I dunno. I tried to load some multimedia and my old friend Rhythmbox did it’s job well as always. That was fine and mp3’s played out of the box. I then moved to video and was disappointed to find that Xine is the default video player. I never liked the interface of Xine much and I find it buggy at best. Why they didn’t just use Totem with the Gstreamer engine like Ubuntu I have no idea but in the end I found the best thing to do was install VLC and just use that. I wasn’t that impressed with gOS as you can probably tell from the tone so far, I get the impression that it’s really just meant to be an Internet kiosk type of thing rather than a proper operating system. I found Enlightenment buggy and the system in general was less than stable. It just seemed to me they’d spent a lot of time removing some of the most useful stuff from Ubuntu rather than improving it, almost the anti-Mint in a way. The choice of Enlightenment is a strange one I think, it would have been a lot easier to just customize Gnome with a theme and remove any its you don’t want. I think it would have been more stable but that’s a hypothetical and I’m not expert. I can’t believe it would use more resources than Enlightenment if that was the concern. As I said it should be remembered that this is made to be part of a package with the Everex PC hardware and perhaps in that setting it works well. The machines certainly seem to be selling well in the states and if it exposes more people to Linux then that can only be a good thing. I can’t help thinking though that this doesn’t really show Linux to it’s full potential. I’ve heard a lot of people saying they think gOS is great for new users but I have to say I’m not so sure. If you just want a platform for running Firefox like an internet kiosk then maybe but it’s not a patch on Mandriva 2008 or Mint 4.0 in my book, even for complete beginners. Maybe that’s just a personal preference and as I said if buying a PC with this on gets more people using Linux then I’m all for it, it really is just the tip of the iceberg as far as Linux goes though and I hope people don’t make the mistake of thinking that this accurately represents the current state of Linux as a whole because it doesn’t, it’s a pale imitation of a full Linux distro for me. Taken on it’s own without the hardware I wouldn’t pick this to install on any system personally, I’ve even heard of a lot of people wiping their Green PCs and putting Debian on instead. Make of that what you will. Thanks for the review. I wonder if it would have turned out different if you looked at it from the perspective of never having used Linux before. There is a tone of “there is so much that’s missing” that a typical newbie to linux would have no frame of reference for. I have tried gOS, and I thought it is not very good. That was a nice review. I suggest you try Geubuntu, because, in my humble opinion, it is the best Enlightenment distro out there. Also it is the most usable since it is combined with XFCE and Gnome to provide things such as a decent file manager (Thunar), the network-manager applet, and it makes GTK apps look much bettere than the ugly unthemed Gnome look. Currently I am dual-booting it with Linux Mint (my favorite distro) and it has been pretty much flawless other than a few minor bugs (such as the Geubuntu and E17 repositories not being available by default). I am also anticipating your review of Zenwalk. I haven’t tried it myself due to your review of Slackware. This upcoming review might change my mind. Ummm… I think you’re a bit confused on who is writing gOS. It’s not Google. Google, the Google logos, are trademarks of Google Inc. gOS is not affiliated with Google or their partners. If Google had released their own OS, it would have had a bit more polish, I’m sure. O dear you are a bit confused if you had bothered to look on the goss site, Its only a Beta version and is not a good version of E17. Their is a module to take screen shots, Thuner is needed with E17 and is as good as anything.I personally use Mint with E17 over the top it is very stable using the Dunnewind version of E17. Nothing in Linux or Windows can look as good as E17 in the right hands. Unfortunately the big players ignore its potential, And reviewers not not do any research before making comments do they?. Above page has a link to a gOS Virtual Machine that can run as a guest on any host OS with VMWare player etc. Looks good as usual Danno- keep up the great work! Firstly I did try to think about this from the point of view of a new user but it’s difficult to forget all that you know. However, my point was actually that people who come to this with no preconceptions of Linux will not be getting the best introduction I feel. If they think that this is the most user friendly distro because of all the hype around it they will get a false impression of how easy it is to use Linux with something like Mint or Mandriva. I think it may tarnish some peoples introduction and first impressions count for a lot. As for the Google connection, I may have been wrong but I read that Google had some serious input into this, maybe not code but certainly influence in the direction of development. It seems I could be wrong and I accept that, I don’t claim to be an authority on Linux (or anything else really) I’m just giving my honest opinion of this software as I see it and that’s all. I will look into the connections with Google a little closer and see what I can find out. Thank you for pointing it out. I hold my hands up to that one. As for this being a beta, do you mean the version of E17 is in beta or gOS itself? I had a look at the site and if this is a beta they aren’t making it clear enough. It should be labelled as a beta. I’m sure E17 can be great on other systems and I’m not knocking it as a window manager I just think this implementation leaves a lot to be desired. In short I suppose the amount of hype I’ve heard about gOS might have caused me to react harshly to it but I really can’t see what all the fuss is about. They seem to be playing up the “google OS” card even if it’s not true. Maybe it will develop into a good OS with time but I don’t think it matches up to the many other great distros out there, for users with any level of experience I would argue there is something better than gOS out there for you. It is the first release though and I will be coming back to look at future developments, I know it’s hard to get everything right first time and I understand that. Nothing in Linux or Windows can look as good as E17 in the right hands. that doesnt mean its not stable, fvwm 2.5. * is called an unstable version yet it is as stable as a rock, some software are developed in a way that they are rock solid wile on cvs, others are not. anyway dan its great to have you back. have enjoyed all your OS reviews. was good to read what the gOS was about. Also am glad to see you are going to give zen4.8 a try. BUT …. Zen 4.8 is (just) another, finely tuned slack derivative. It is up-to-date. And light-weight with fewer, well selected apps. It’s old name was mini-slack…. BUT. it uses a nimble text installer, just like other slacks, like vector, and you don’t much care for slack text installer, do you ? However. if you are looking for a great slack experience, and want a light, nimble, clean stable xfce desktop, you might enjoy zen 4.8. Like other slacks, zen 4.8 offers as default an up-to-date xfce window mgr, along with other window manager options thru netpkg. I happen to run it an older machine here, and with xfce, the older CPU flies like a rocket, or a slack. you’ll see. Look forward to the review, but I am feeling I can possibly guess your reactions to the ‘zen’ experience. I didn’t mind the installer with Slackware to be honest the text based screens were not really the problem, it was more getting the system to work as I wanted after that, the lack of a package manager (which I’ve since learned you can fix) and so on. I will look at Zenware with as open a mind as possible. I’m not too worried about Gnome either, I can’t deny it’s my favourite environment but I’m open to other things, I’ve used KDE a lot, XFCE not as much so it will be good to try it out a bit more. Well Dan, you seem set to go off into the world of XFCE distro’s next. I recently just took a tour there, and its quite impressive. Zen is good, and DreamLinux is definitely worth a look as well. Its a bit touchy but is extremely well done. Then, there is SamLinux too. This is based on PCLos and is quite well done and a pleasure to use. Then of course we have Xubuntu, which became my primary OS on my old server machine, and is certainly very well done. Give them all a go! I have not yet tried Wolvix or GoblinX, which I hear are more for advanced users, but very solid distro’s as well. Hey Dan! Thanks for the review. I had been one of those that requested you take a look at gOS a few reviews back. I tend to agree with your assessment of gOS FWIW. “Internet Kiosk” is an apt way to describe it. So on to Zenwalk! I like Zenwalk and prefer it to Xubuntu. Anxious to hear what you make of it. Don’t forget Wolvix!!!! For a new distro it has a lot of slick options. If you want to try Slackware based, Xfce using distros try Zenwalk, Wolvix and Vector. For other reviews of each check out distrowatch.com. Wolvix starts out as a live cd. I use Zenwalk.